The gadget shows the weather and boasts a big amount of internal storage and ability to play music, radio. There is no auto deleting of old photos from internal storage. 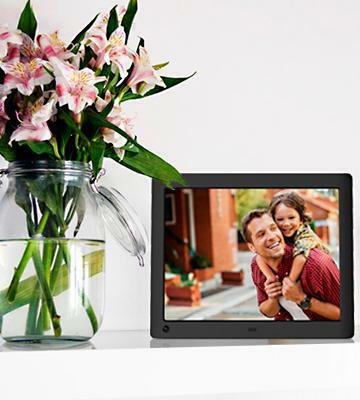 This multifunctional digital frame has an access to the best pictures from Facebook, Google+, Instagram, etc. It is a perfect choice for people leading an active life as they can send taken photos to any Pix-Star digital frame in the world. Rotation mode turns on automatically every time when a position of the frame is being changed. The frame boasts unusual effects of a picture presentation. The model lacks USB port. 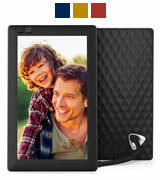 This photo frame is an ideal for storage of a huge number of photos as it has 8 GB of internal memory. 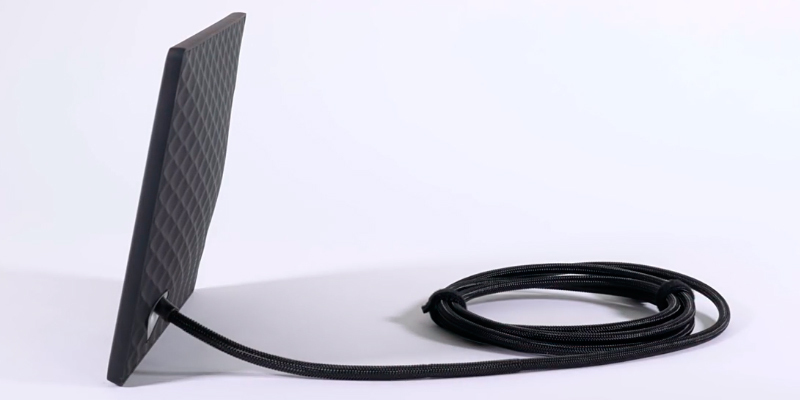 Moreover, the manufacturer also provides 10 GB of Cloud Space which can be synced between several Nixplay Seed gadgets. Taking into account a relatively small size of the display, the output picture has almost no flaws and is shown in high detail. It can be put only horizontally. 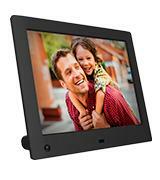 This digital picture frame will suit those who need to watch not only photos but also videos. The model has a motion sensor which switches the gadget off when you leave the room. 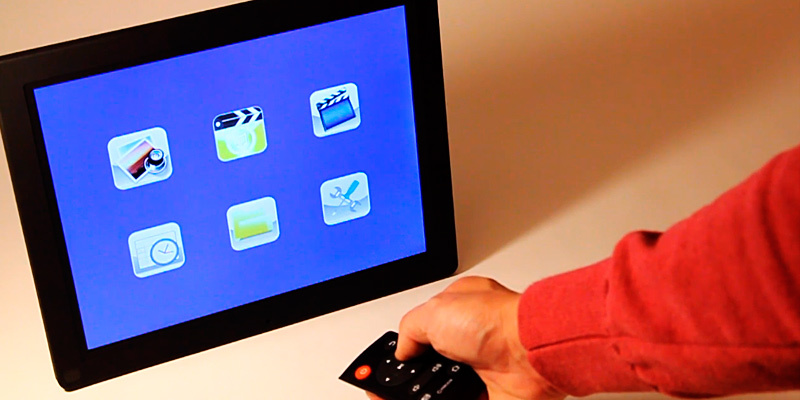 This device has a sleek design, a control remote, and a great display. It also supports the MKV and MP4 video formats encoded with H.264 or MPEG4 with an HD resolution. The pictures are shown in random order until you update the software. 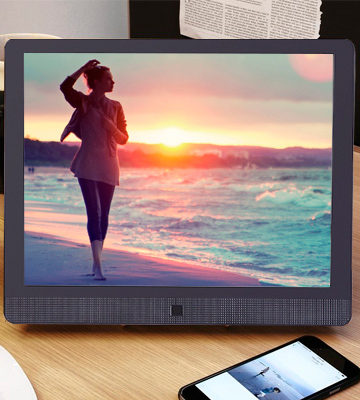 This multifunctional and stylish digital photo frame will prove to be a great addition to your home or office regardless of your preferences in terms of features and design. A light sensor can regulate the brightness of the display according to the lighting conditions. No opportunity to hang it on a wall. The given frame is perfect for office use, as it has a suitable size and features some great organizer functions such as a clock and a calendar. 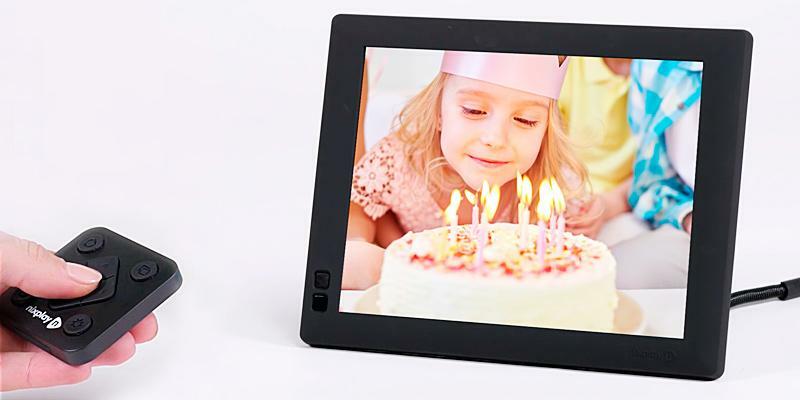 If you want to have a big digital photo frame with a bright display, 15" frame from Pix-Star company is definitely what you need. The device has been made in accordance with LCD technology and has LED backlight which makes the image ideal even if the room light is very bright. Great color rendering, good visibility, 1024x768 resolution and 4:3 aspect ratio provide the pictures of high quality. One more characteristic which will make the usage of Pix-Star photo frame more pleasant is its time management function. You can configure time parameters in such a way that the device won't work at night, thus, saving your money on electricity bills. We can state that possibilities of this device are unlimited. 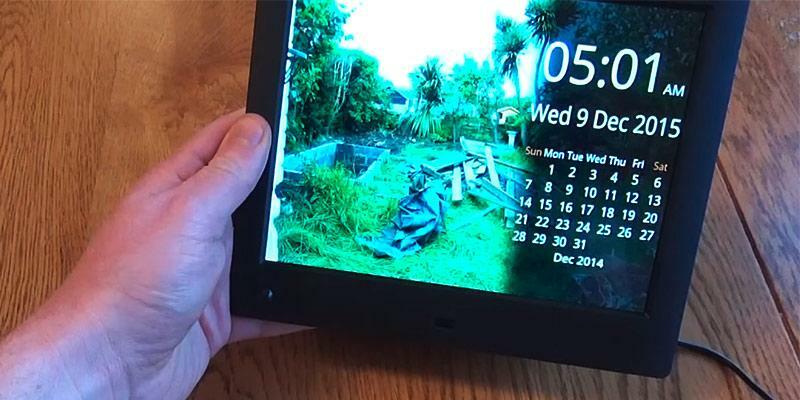 This photo frame boasts Wi-Fi connection with the help of which you can see the weather forecast for any country or city you choose. You are also able to listen to Web radio. Except its ability to show both photos and videos in numerous formats, this frame can take them from different resources such as Facebook, Instagram, Google+, One Drive and others. Special iOS and Android applications let you look through the photos on Pix-Star display wherever you are. Moreover, you can receive shots from friends or relatives via e-mail. The manufacturer has also provided 4 GB of internal storage, so you don't need to buy any additional memory cards. However, if you lack this capacity, the gadget supports cards of SD, SDHC, SDXC and MMC formats as well as a flash drive. You can choose different sorting modes which can show old or new photos at first, depict them randomly or in alphabetical order. 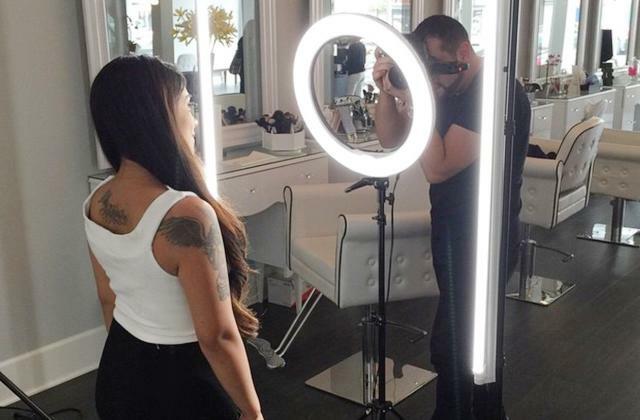 The shots can be also shown as one photo or in the form of collage of 4-5 pictures. It is very easy to operate Pix-Star photo frame with a remote control or buttons which can be found on the back panel of the frame. The last but not the least, due to the motion sensor, the device switches off when you leave the room, thus saving energy consumption and prolonging the frame's life span. The frame's diagonal is 15" and this size makes the frame suitable for hanging on the wall or putting on a shelf. However, it won't be comfortable to have such a big frame on a desk. If you want to have a digital photo frame at your workplace or in the office, we would recommend you to purchase the frame of this manufacturer but of another size. Made of glazed plastic, it will perfectly suit any interior. 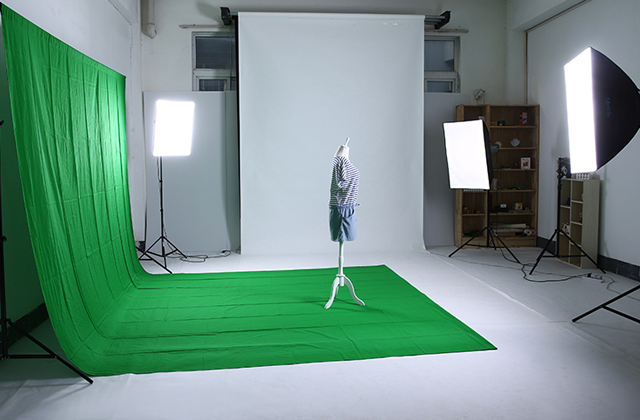 The removable prop can be set in order you can place the frame both vertically and horizontally. Yet, if you take the prop away, you can hang the frame on the wall. Pretty convenient! 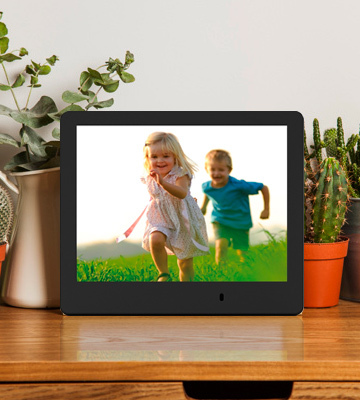 Nixplay Seed WiFi photo frame is a perfect storage place for your favorite pictures. The gadget has 8 GB of internal memory that is enough for keeping about 25,000 photos - as you can understand, this amount is really impressive. What's more, the manufacturer has also provided 10 GB of cloud space so the number of photos you can store increases dramatically! One more peculiarity of this model is Wi-Fi connectivity which allows looking through the images from cloud space wherever you are. As this feature implies the Internet access, you can also watch photos on social networking sites such as Facebook, Instagram, Flickr, and Picasa. Additionally, you can sync your smartphone with the frame and send new photos directly to the frame from any corner of the world. However, don't forget to install special applications first (they can work with Android as well as with iOS). The frame can depict photos of the most widespread formats - JPEG, JPG, and PNG. So, there is no need to edit them before displaying. Due to the variety of settings, you will be able to create separate albums and choose the sequence of photos. The frame's usability is determined by the fact that it is controlled with a remote control. 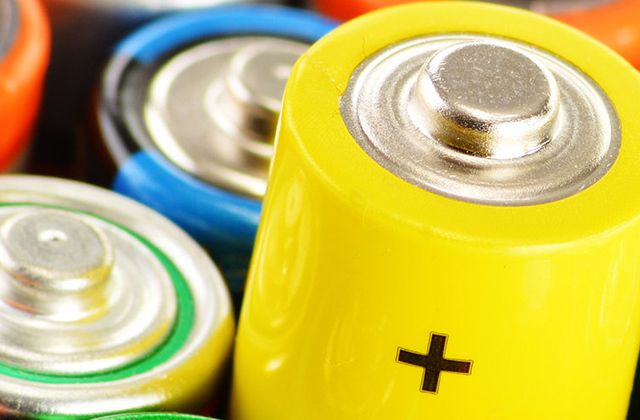 In addition, a motion sensor is an ideal function for energy saving as it switches the gadget off when there is no one in the room. 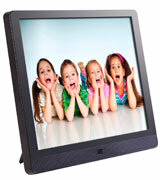 This digital photo frame possesses a high-quality display designed in accordance with IPS technology. The advantage of such displays is that they have a big viewing angle. Such feature provides vivid pictures regardless the angle at which you're looking at the screen. High contrast and great color rendering together with 1024x600 resolution make your photos clear and realistic. In order to keep your device in a proper condition and clean fingerprints off its screen easily, we would recommend you to purchase a cleaning kit additionally. The given photo frame has 8" display which allows you to put it on a desk, bedside table or a shelf and enjoy the great quality of pictures. The realistic and detailed image becomes possible due to 1024x768 resolution which is pretty good taking into account a relatively small size of the frame. If you want to watch your photos in a bigger size, you can find this model with 10", 12", 15", and 18.5" displays. NIX Advance Hi-Res frame shows photos of the most wide-spread JPEG and JPG formats. 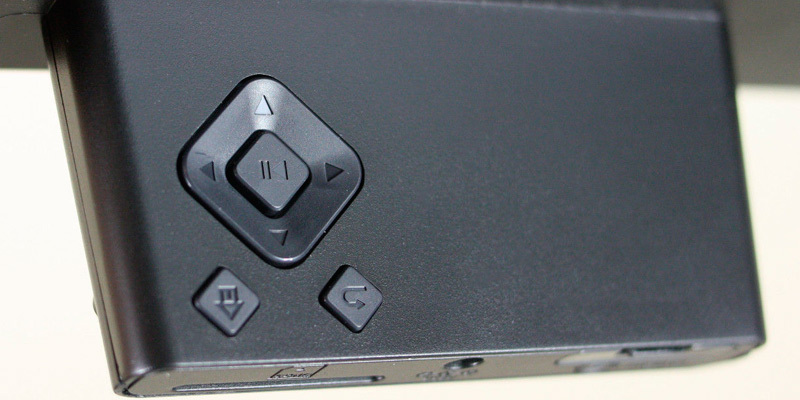 Moreover, it can play MP4 video with the sound spread via 2 stereo speakers 1.5 W each. All this can be performed by connecting SD/SDHC memory cards or a flash drive. The frame has a motion sensor with the help of which the gadget scans the room, and if there are no any movements, it switches off the device for the period from 5 to 60 minutes (you can set the time yourself). Note that the frame also boasts clock and calendar functions that are also very useful. Finally, if you want to change the picture but you're far away from the frame, you can do it using a remote control. The frame is made of black dull plastic, and this material makes the device's appearance stay perfect as it cannot be spoiled by fingerprints left on its surface. Front bottom part is equipped with motion sensors; control buttons and ports are situated on the back side. Perhaps, some people consider the frame's ability to stay only in a horizontal position as a drawback, but we are sure that this frame will add elegance and individuality to your desk at home or at work. People have been looking to capture the most meaningful moments of their lives and men of importance way before the photography was invented. Before the introduction of digital cameras, displaying whatever picture you wanted was as simple as getting a wooden frame and putting a screw in it. But after the digital cameras started to dominate the market, having a portrait of the person most dear to you sitting comfortably on your nightstand became sort of complicated. This is where the digital frames came along. A digital photo frame is a picture frame that is generally designed specifically for the stationary, aesthetic display of photographs without the need for a computer or printer. Of course, a lot of them tend to have a variety of additional functions. 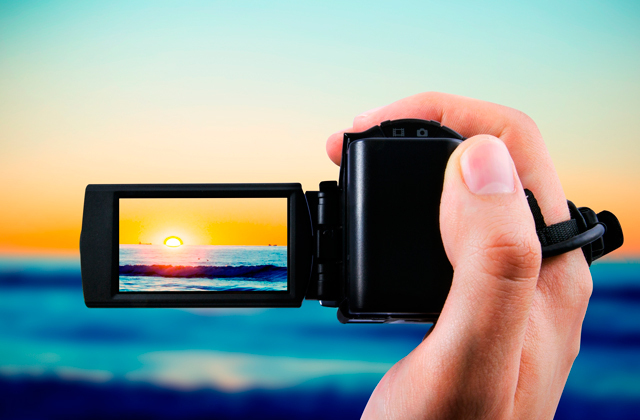 Some are looking for a digital frame with its own email address or a frame that was going to call them to remind to go on another vacation. But first and foremost, people want superb picture quality, and would generally prefer a frame that would recognize portrait orientation and adjust accordingly. 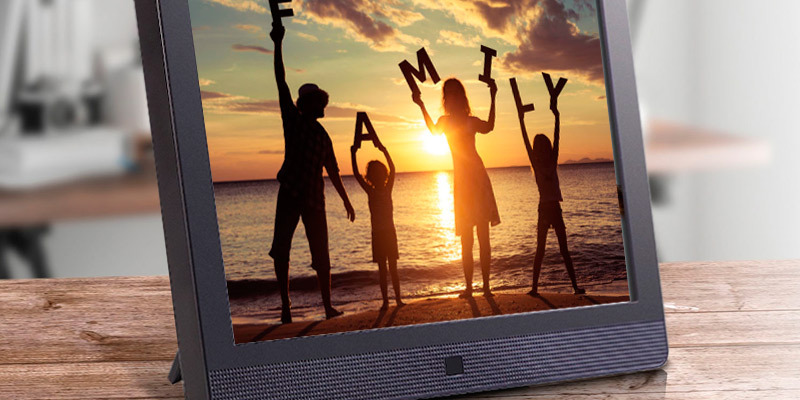 The Micca M803A Digital Photo Frame will satisfy the needs of anyone looking for a basic frame with a standard set of functions but may also please some that would prefer their frame to have a few additional features. When it comes to design and visual quality, the Micca Neo-Series M803A is not going to be the one to fall behind. The sleek metal case is less than 3mm thick, presenting a modern minimalistic appearance. 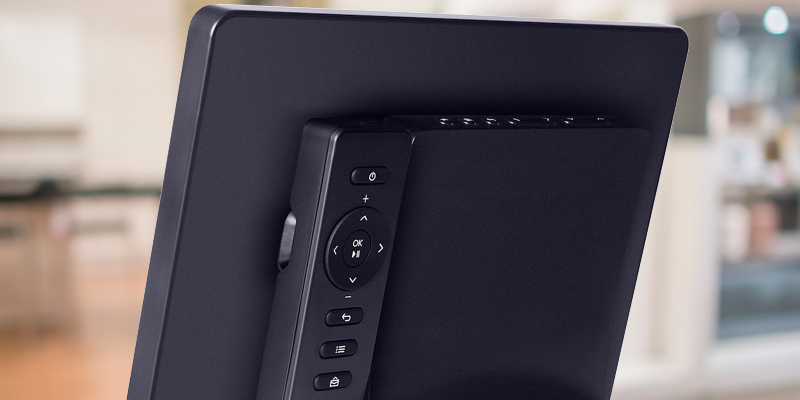 All controls and connections are folded away in a small pod on the back that doubles as a tabletop or a shelf stand, opening up possibilities to place the device anywhere you feel comfortable with. 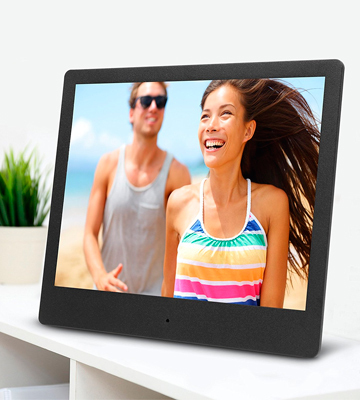 The NEO series is Micca's best digital photo frame, comprised of premium materials and quality construction. The M803A is equipped with an 8-inch (diagonal) 1024x768 high-resolution IPS LCD screen with rich colors and superb detail. 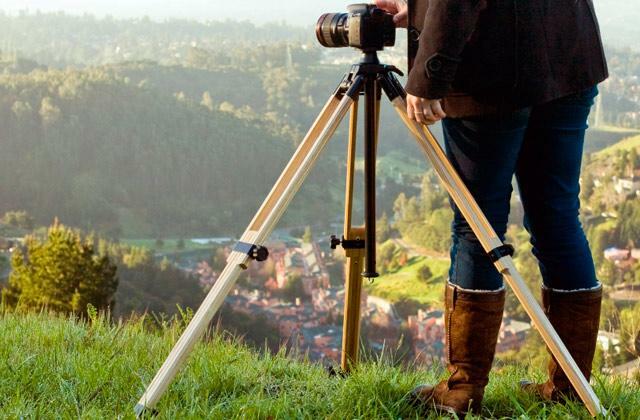 Along with exceptional brightness and view angles, your photos are going to look great from anywhere in the room. In addition to photos, NEO photo frames also play popular video formats including MP4 and MKV videos encoded with H.264 and MPEG4, at resolutions up to 720p. You can also experience your favorite music with MP3 music files played through the speaker or a headphone jack. 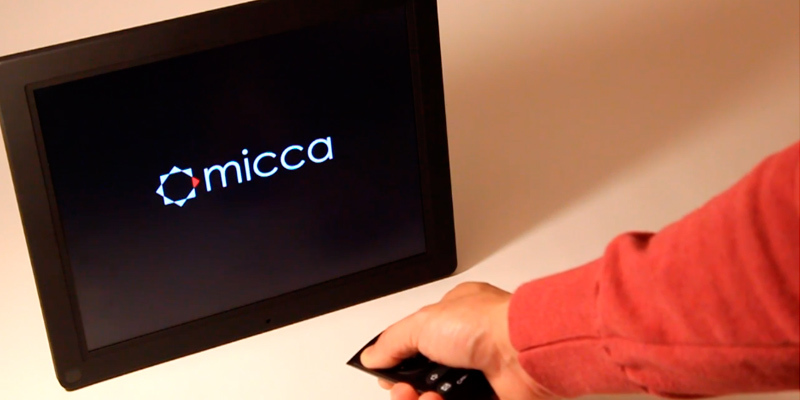 The Micca M803A Digital Photo Frame also boasts an automatic on/off timer. You can set the photo frame to start and stop based on a daily, weekday, or weekend schedule. 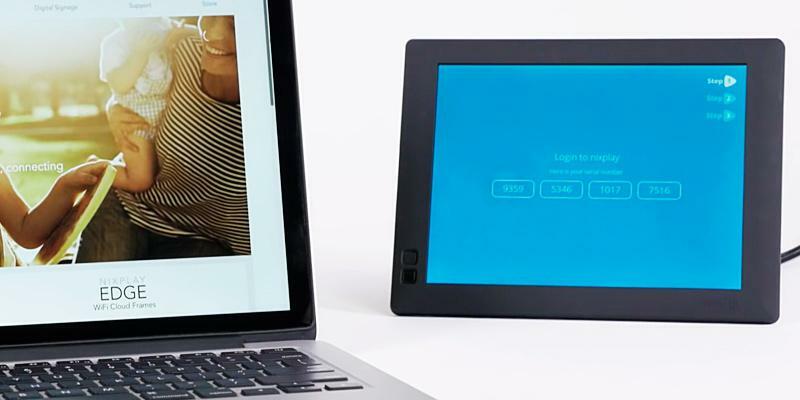 The device supports SD cards and USB drives up to 32GB so you can display as many as 10,000 photos in a continuous slideshow in random or sequential mode. 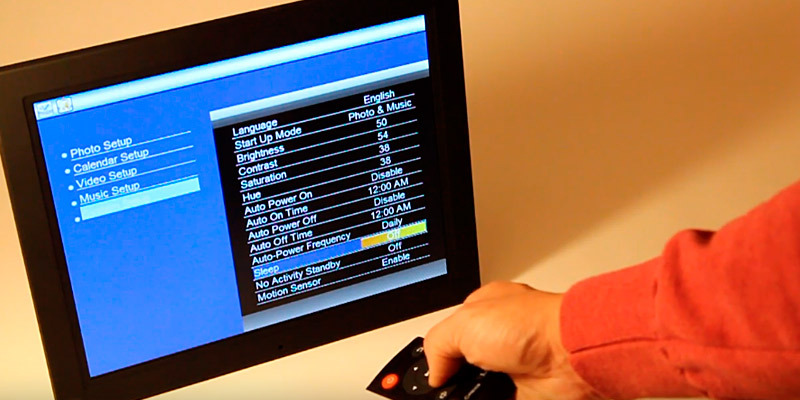 You can control the photo frame using built-in buttons or via the included ergonomic remote. Clearly marked buttons and a comfortable shape make operating the entire thing as easy and convenient as possible. The Micca M803A will prove to be a great choice for anyone looking for a digital photo frame regardless of your preferences and requirements. 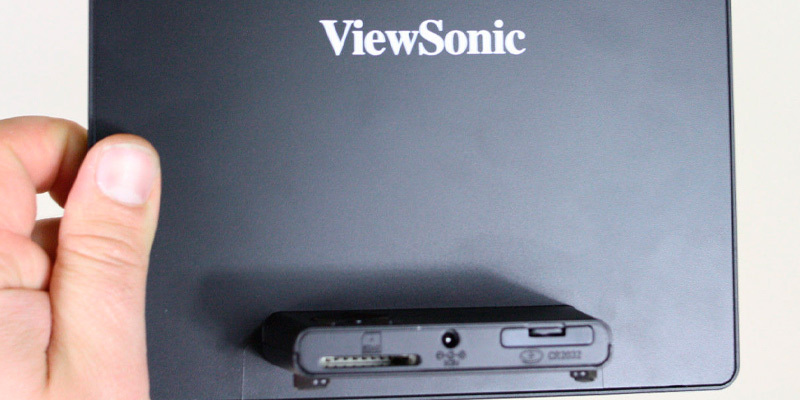 The display of ViewSonic VFD820-70 digital frame is 8" and such a size lets you watch your photos and videos comfortably. The display has been designed on the basis of TFT LCD technology which provides a great color resolution, brightness, and contrast of the image. 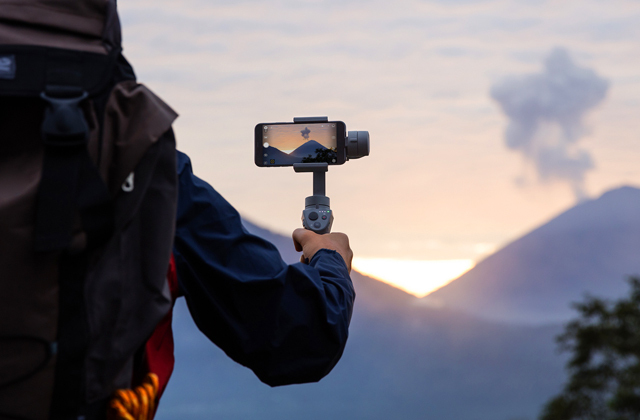 800x600 resolution and 4:3 aspect ratio make your pictures more detailed and realistic, so you can enjoy the life moments as if you are experiencing them again. 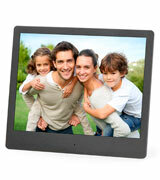 This digital photo frame supports memory cards of MMC, MS, SD, SDHC, and MS Pro types. 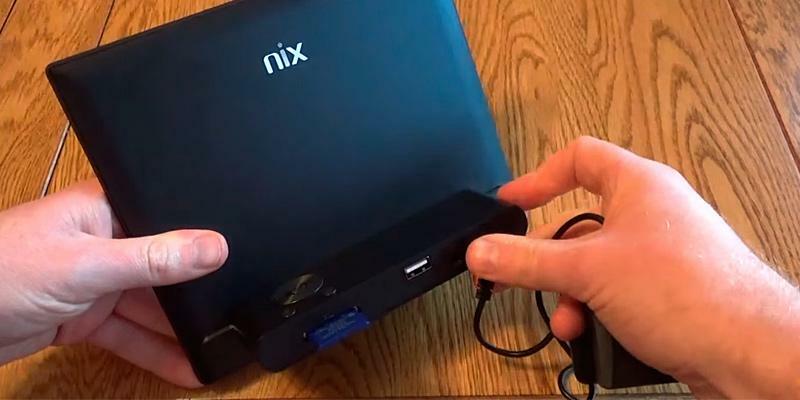 Moreover, you can plug in a flash drive via USB port or connect the frame to your computer with the help of a miniUSB slot. You can also change the speed and transition effect between photos when you wish. The light sensor helps to save energy consumption by lowering brightness while calendar and clock functions are on. Additionally, it is very convenient to configure the frame with the help of both buttons and remote control. 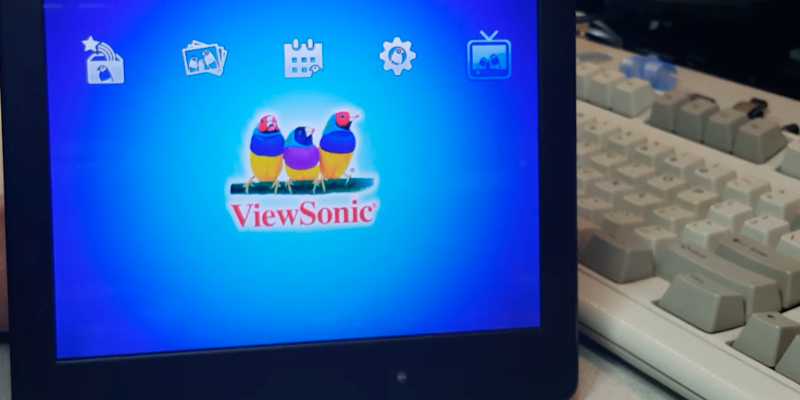 ViewSonic VFD820-70 is a frame made of white glazed plastic which looks fairly stylish. However, if you think that white frame will be easily dirtied, you can order the one in black color. But we are sure - no matter what color you'll choose, this frame will definitely adorn your workplace or favorite room at home. Finally, it is easy to use this gadget thanks to the operational panel which is situated at the back and, thus, doesn't spoil the overall look. A lot of people who take photos like storing and watching them on a computer as it is much more convenient than printing them, then looking for a suitable frame and wasting time on hanging it on the wall. 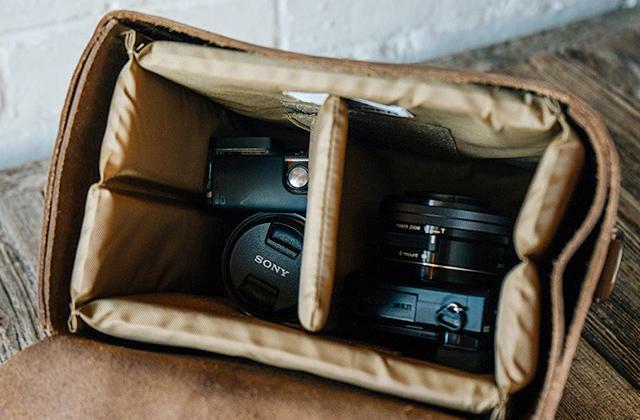 However, nowadays you can store your shots in a more comfortable way – in the digital photo frames. These devices store the pictures in internal storage or in an additional flash card. 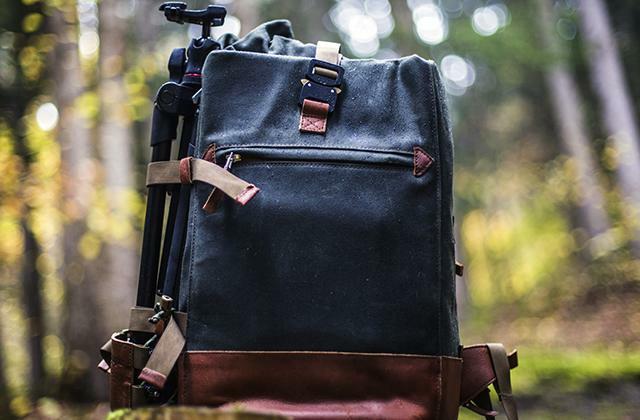 Technical characteristics of these gadgets allow you to view all photos in wonderful quality. Having such a device, you'll also be able to save a lot of space by throwing out old photo albums which won't be necessary anymore. These useful gadgets let you have a look at pictures of the brightest life moments anywhere you like - in your bedroom, kitchen, or even office. 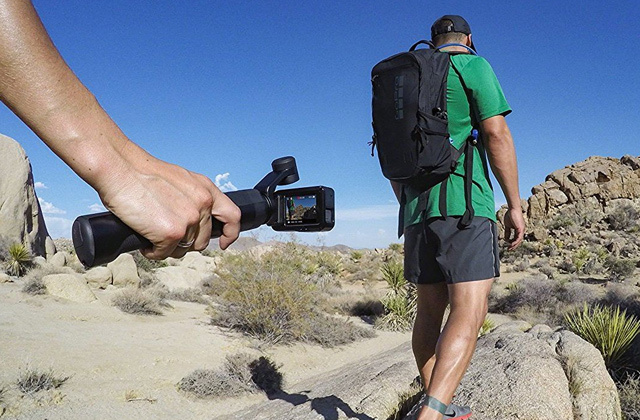 You can also be interested in our best action cameras that take high-quality photos and videos which you may store with the help of digital photo frames. As display determines the quality of your pictures, this is the first and the most important feature you should pay attention to. As a rule, displays of digital photo frames vary from 7" to 15". However, you can find bigger sizes if you need. If you want to hang it on the wall, make sure that the display is big enough and pictures don't seem small at a distance. Still, if you plan to put it on a desk, a 7" display will be enough. Note that display characteristics such as color rendering, resolution and backlight can be different too. 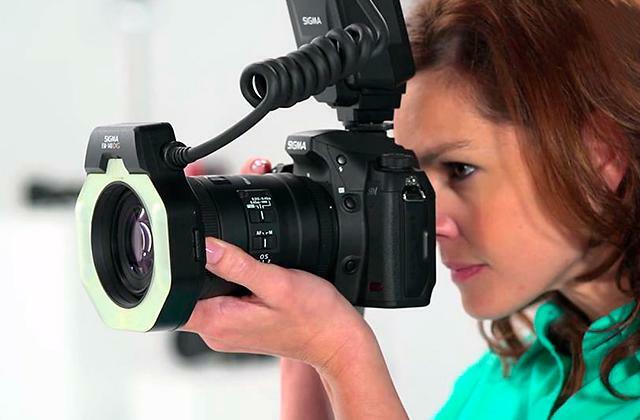 Be attentive about display resolution as it provides the quality of your shots. It is obvious that if the display has a big size, the resolution should be also big. A good resolution will make your photos more realistic and allow seeing even the smallest details. As a rule, digital photo frames don't have so many features compared to tablets or smartphones. Their main task is to display pictures. 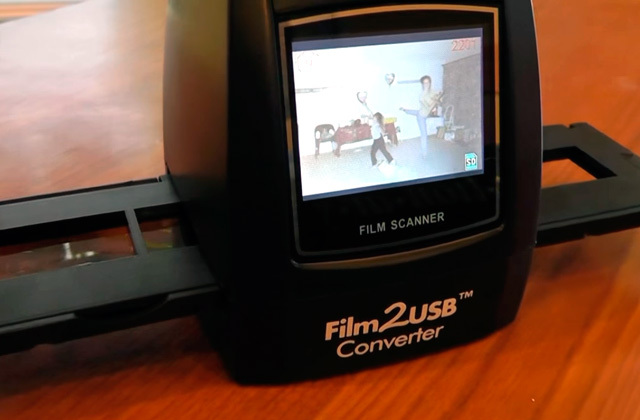 However, all of them support additional flash cards for extended memory, and some models even have USB slots which give a chance to watch shots and videos via computer or TV. We would like to stress that ability to support different formats is a significant feature. The more formats the frame can deal with, the less time you'll spend reformatting photos on your PC. Built-in calendar and clock make frames even more versatile. As for display functions, there are frames which are able to rotate pictures 90, 180 or 270 degrees. Some models of digital frames have speakers which allow you to listen to the radio, music or even watch videos. The best design of your future gadget is the one that will perfectly suit your interior. 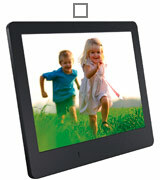 Digital photo frames are usually designed in two colors - black or white. They can also be dull (not leaving fingerprints on its surface), glazed and with various ornaments. 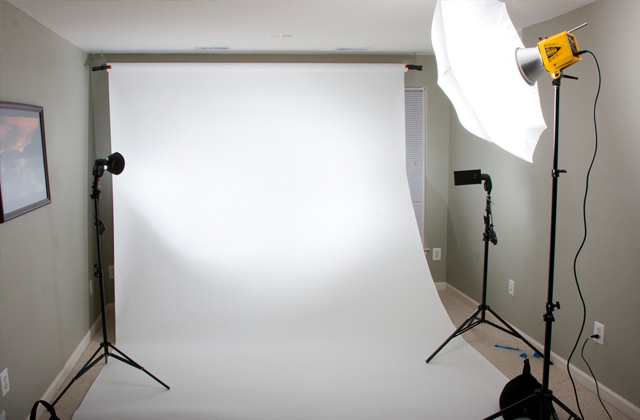 While choosing the best model for you, consider frames' abilities to stand both vertically and horizontally, an ability to change the angle of a slope and be hung on the wall. 1. Wendy Sheehan Donnell How to Buy a Digital Photo Frame, PCMag. December 15, 2011. 2. 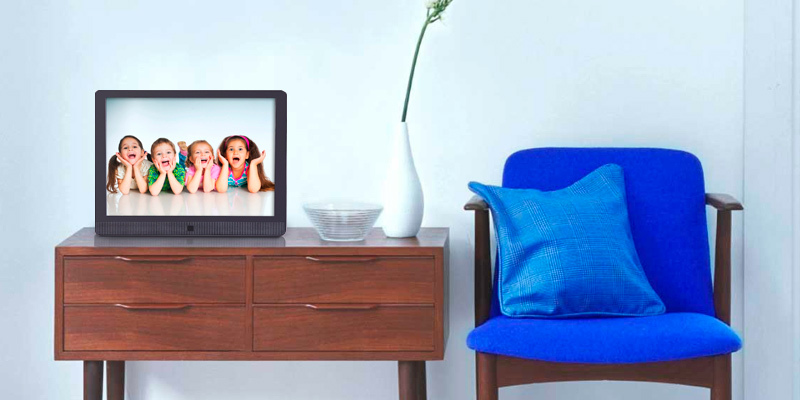 Your Guide to Buying Digital Photo Frames, eBay. March 3, 2016. 3. 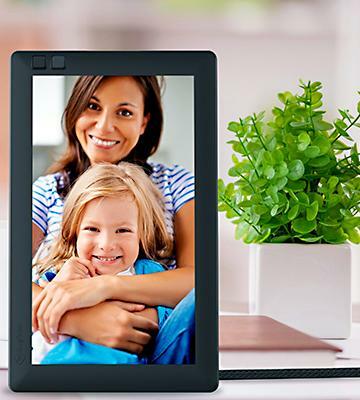 Digital Photo Frame Buying Guide: 5 Factors to Consider, HubPages. February 24, 2015. 4. How to Buy the Best Digital Photo Frame, Which? 5. Michael Hsu 5 Problems with Digital Photo Frames, Solved,TheWallStreetJournal. March 5, 2015. 6. Brian Nadel Digital Picture Frame Vs. Photo Album, Tom's Guide. April 19, 2010. 7. Buying Digital Photo Frames: Tips for Choosing the Best Digital Photo Frame for You, TheFunTimesGuide. 8. Digital Photo Frame, Wikipedia. July 14, 2016.